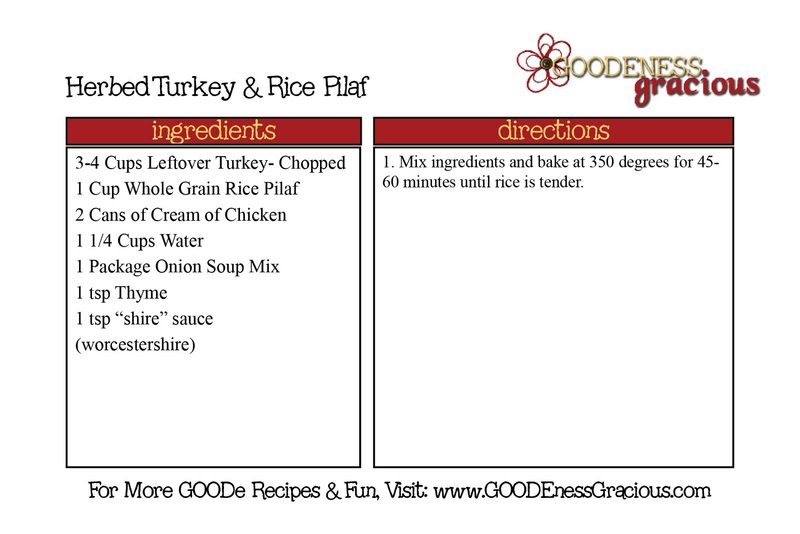 Herbed Turkey and Rice Pilaf is one of my newest faves from FREEZE-o-RAMA. I have adapted a recipe I found in one of my — you guessed it– Gooseberry Patch Cookbooks, Best Casseroles to be exact. When looking for recipes that I could adapt for my Tina Turkey, I found this and thought I could make some alterations to make the recipe a little quicker and perfect for my freezer. I started with 1 cup of a good quality whole grain rice pilaf. Personally, I don’t care for plain old brown rice (unless it is at PF Changs), so I opted for this awesome pilaf. Freeze it up or bake it up at 350 degrees for 45-60 minutes until rice is tender. Delicious and healthy and Miss Add approves–Mommy score! You've inspired me to take a smoked turkey out of the freezer and make it for dinner tonight . Yum! This looks great! I'd love for you to stop by What's Cooking Wednesday and share a recipe (http://thekingscourt4.blogspot.com/2010/09/brand-new-whats-cooking-wednesday.html)!